This elegant ring in pure silver designed with a 16-Mukhi Rudraksha is a perfect talisman with bhasma and metal of planet Moon enclosed in tubes, and beeja mantra of planet Moon inscribed on its sides. 16 mukhi is also called Jai (victory), as the wearer is bestowed with victory in all stages of life. 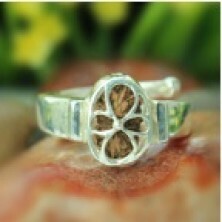 It bestows a flow of positive energy, harmony, peace, protection and security. This Rudraksha is ruled by planet Moon also called Chandra in Sanskrit meaning "illustrious". Moon is considered to be one of the best planets as it promises wealth and happiness. It is ruled by Lord Mahamrityunjaya. Rudraksha beads may be worn as necklaces, bracelets, rings or lockets. This 16-Mukhi Moon planetary ring is convenient to wear and bestows you the grace of Lord Shiva.